All photos courtesy of The Saguaro Palm Springs Hotel. 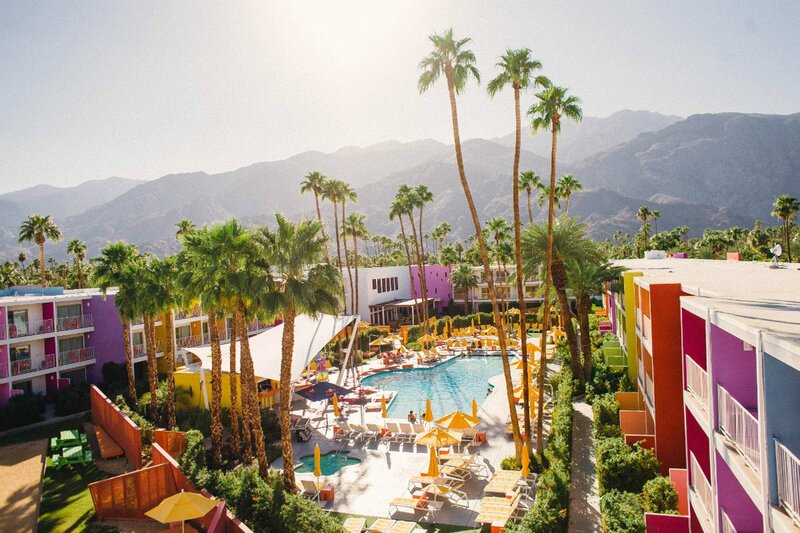 Within moments of your arrival at The Saguaro in Palm Springs, it will become very clear why the desert hotel is an Instagram sensation. 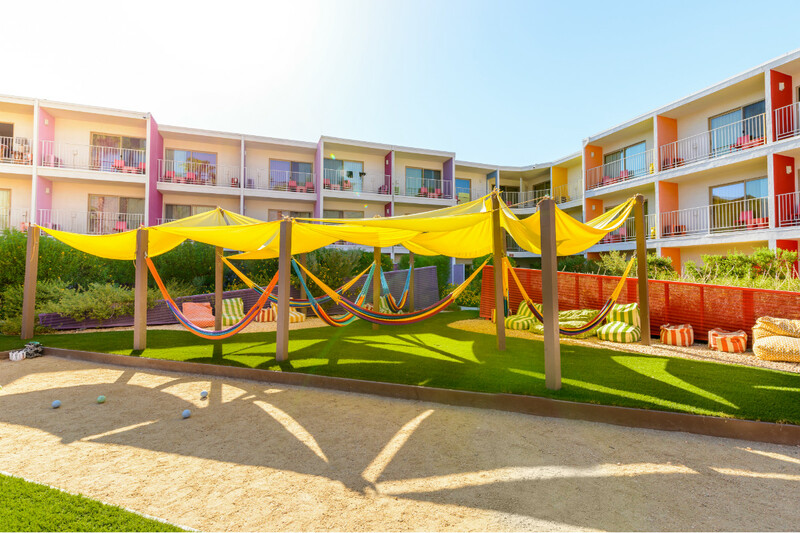 Splashed with fourteen popping colors reminiscent of desert wildflowers, the hotel’s playful, sunshine-y vibes immediately draw in guests. After a refresh this past September, the colors are especially vibrant. The structure is an incredible contrast to the neutral desert palette, and the atmosphere matches its hues: The hotel has a lively social scene and an assortment of on-site activities — all at a reasonable price point. Vibe: Joyful colors obliterate pretenses — no one takes themselves too seriously here — and the atmosphere is social, hip, and playful. Standout Detail: Sun worshippers drape themselves around the Olympic-sized pool at all hours (breakfast, lunch, and afternoon snacks are served here). Summer weekends mean pool parties, when the hotel brings in a DJ. There are also night swim hours and pitchers of hibiscus margaritas to wash down all those Baja fish tacos. This Place Is Perfect For: Lively young singles, couples, or groups of friends open to meeting new faces. It makes for a coveted wedding location — in the days leading up to the main event, bring on the bachelorette crew and giant ring-shaped floaties (check the website for a ). It would also make for an excellent landmark for an LGBTQ couple who want the rainbow theme taken to a new level in their wedding photos. Rooms: The 244 technicolor rooms give off ‘70s vibes, each with either a patio or balcony. Guests choose their view, whether they prefer to overlook the pool, garden, courtyard, or mountains. Rooms closer to the pool are more expensive. On Site: Despite the social scene, guests have plenty of places to go relax and rejuvenate. Free daily yoga classes are a highlight, as is the full-service spa with six treatment rooms and a 24-hour gym. A bocce court cozies up to an inviting hammock nook, which begs to be lounged in with an ice cold Mexican Coke. An indoor ballroom connects to an outdoor terrace that overlooks both the pool and desert mountains. Brides and bosses alike can shamelessly opt for the hearty taco station (great idea). San Jacinto Lawn hosts the occasional outdoor movie night, a good group event for after-work hours. Food and Drink: On property is the best-in-the-desert El Jefe Mexican cantina, a rock n’ roll joint with over 100 tequilas on offer. They serve breakfast, lunch, and dinner, with deals on Taco Tuesdays and Thursdays. Rocco’s Electric serves brunch for the early risers, opening at 7 a.m., with healthy, trendy options like avocado toast. Downtown Palm Springs is just a five-minute, complimentary shuttle ride from the hotel, where a world of mid-century modern architecture awaits. Shop for vintage desert moccasins at , and fulfill those funky food cravings with cardamom coffee carrots and salmon al pastor at in the Ace Hotel. The is three miles down the road. Free desert cruisers are available for active guests who want to roll through town. For an adventurous day trip, Joshua Tree National Park is a 50-minute drive away, where hiking and biking trails promise incredible views.